14.5 hp* Kawasaki® FS481V 603cc Fuel Capacity 5 gallons (19 L) Height of Cut 1" to 4-1/4" in 1/8" increments (2.5 cm to 10.8 cm in 3mm increments) Starter Recoil Drive System 5-Speed Transmission Air Filter 2-Stage Air Cleaner Adjustable Discharge Standard Blade Tip Speed 18,500 ft/min (5,639 m/min) Brake System 6" (15 cm) Band Brakes Caster Tires 9" x 3.50-4" (23 cm x 9 - 10 cm) Deck Design 48" (122 cm) TURBO FORCE Discharge Chute High-performance 5/16" (8 mm) rubber Drive Tires 13" x 6.50-6" (33 cm x 15.2 - 16.5 cm) Ground Speed 6.2 mph (10 km/h) fwd; reverse assist Spindle Housing Cast iron with 9-3/8" (24 cm) base Steering Controls T-Bar Disclaimer *The gross horsepower of this engine was laboratory rated by the engine manufacturer in accordance with SAE J1940. 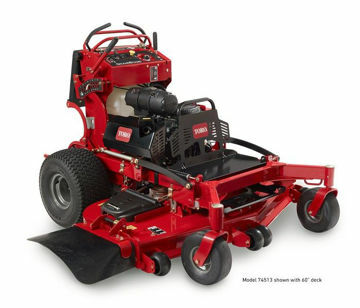 As configured to meet safety, emission, and operating requirements, the actual engine horsepower on this class of mower will be significantly lower. Toro Grandstand with Turbo Force Deck Improves productivity and saves trailer space too!